This embryonic site will eventually hold a great deal of hardware detail pertaining to the IBM S/360 Models 65 and 67. At the moment it is just a repository for the odd snippet where there is an immediate need to make information available for a particular purpose. If you link to any particular part of this website be aware that the structure will change when I revamp it and "do it properly"! (The home URL will, of course, remain.) This is not likely to be for at least a year though. You are welcome to download anything on the site for reuse with suitable attribution - e.g. "Source: www.IBM360.info". All the documents below are scans from my own hardcopies. To keep thing quick and tight I have used the lowest resolution that is easily readable. At some point I intend to high-res scan the main IBM documents (FETOMs, FEMMs, etc) for inclusion on the bitsavers site. When speaking (or thinking!) FETOM is pronounced as "fee-tom", FEMM as "fem", and FEMDM as "fem-dem". 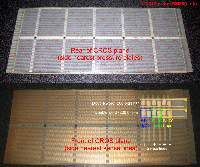 Below are some annotated pictures of gates C and D of a S/360-65 illustrating various elements of the CROS. 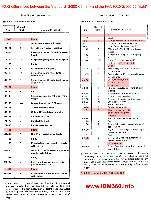 Below is an annotated picture of a Model 65 CROS plane. Below is an illustration of the differences in ROS field (micro-order) structure between the standard and FAA 65s. It can be seen that what were 'spare' bits in the standard 65 have been allocated new functions in the FAA 65. 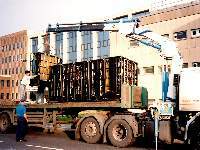 It is significant to note that nothing has been taken away from the standard machine's ROS. 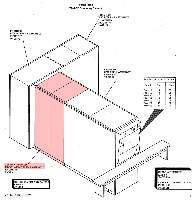 Below is the page from the 7201-02 Parts Catalog covering the front panel rollers. There is a total of 72 separate printed roller legends ("decals") with part numbers in two numerical groups: 573XXXX and 578XXXX. I am guessing that '573' decals relate to the standard 2065 and haven't changed for the 7201, whereas the '578' decals are new for the 7201. No great revelations here but the information may assist in defining the differences between the 2065 and the 7201. CROS bit listings for the 7201-02. The third column headed "CLD" gives the number of the CAS page the block appears on (e.g. QY051) and the 'grid reference' of the block on the page (e.g. N8). The main part of the page shows the actual bits (0 or 1) broken down into fields and parity bits. Note the only unused bit in each ROS word is the second bit (bit 01) which is set to 0 in every ROS word. CAS microprogram listings for the 7201-02. See the "IBM 9020 7201-02 Control Field Listing" for details of how to interpret these CAS blocks. One of the key things I want to do with this website is to document the differences between the 'standard' IBM S/360-65 and the FAA IBM S/360-65. 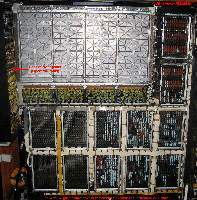 The former is known as the 2065 CPU and the latter as the 7201-02 CE. 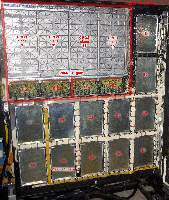 Here are the details of the front panels of the two machines. Very similar but a few differences. I will document the differences in detail later. 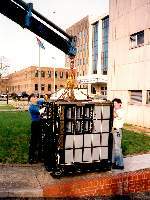 The '9020' was a large computer complex based on IBM S/360 technology. 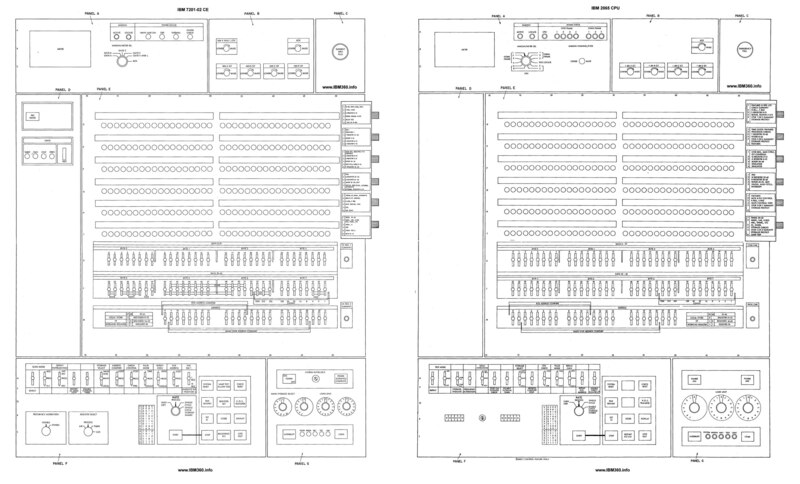 The largest 9020 configurations consisted of a 9020D CCC (Central Computer Complex) and 9020E DCC (Display Channel Complex). 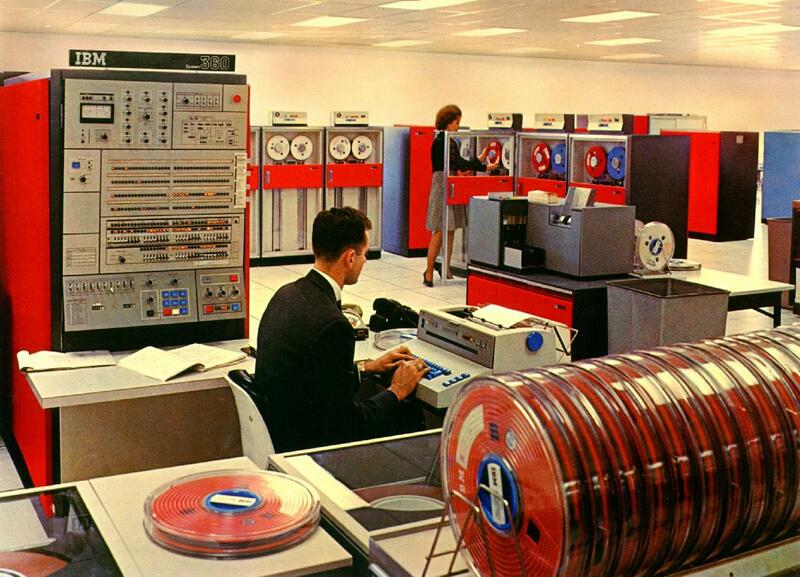 A maximum configuration CCC/DCC complex contained no less than 12 IBM S/360 mainframes! Not all FAA ARTCCs (Air Route Traffic Control Centers), of which there were 20 (plus one in the UK), had the maximum configuration. 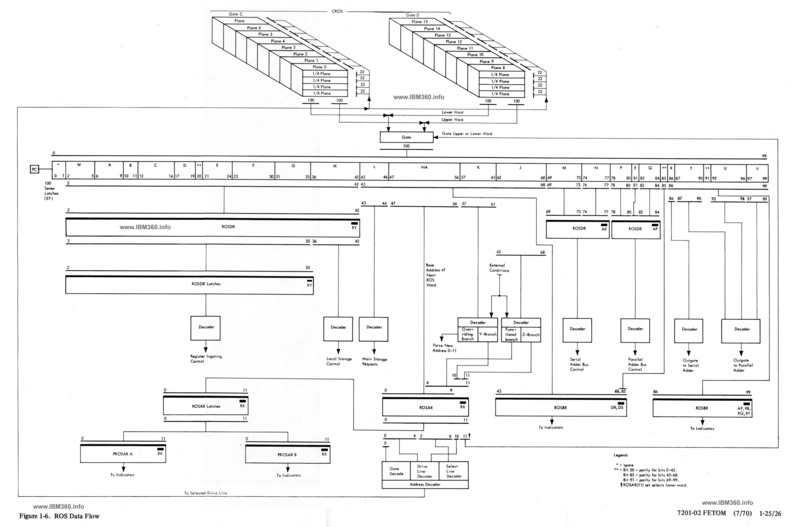 The UK system had 'only' 8 mainframes - 4 x S/360-50 and 4 x S/360-65. 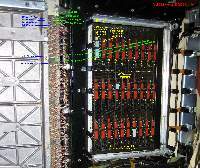 This schematic shows the maximum configuration, with the mainframe boxes highlighted in blue. 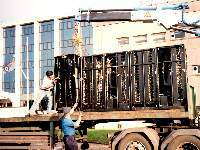 Below are some pictures of the final load of scrap S/360 frames leaving the site of the UK 9020D system for the melting pot. I am in the process of transferring some old IBM 800bpi NRZI program and data tapes to the PC. I need the tapes to end up on the PC in "AWS" format, which is described here www.cbttape.org/awstape . I have transferred the first program tape (which is physically labelled "NON LIBRARY LOADER CD017 REVISION 28") to the PC, where it exists as a single 5,903,231 byte EBCDIC binary file (tape01.bin). This file lists, for each block: 1) The block number; 2) The block size; 3) The block start offset into the file; and 4) The block end offset into the file. Some of this information is redundant, but it enabled me to verify the accuracy of the block information by cross checking. There is enough information in these two files to enable an AWS format file to be generated. The file referred to above contains 1,597 blocks so it is impractical to manually edit the .BIN file to create a .AWS file. However, I also transferred a smaller file that consisted of only four blocks. Having such a small number of blocks it was possible to manually edit the file to create an .AWS file. Here it is: FLUT01.aws . I used Hex Edit to edit the .BIN file. The .AWS file can be viewed using AWSBrowse which can be found halfway down this page. "FLUT" is the Fault Location test Utilty Tape. It is stand-alone (i.e. doesn't require an OS) and can be directly IPL'd into a S/360 system. Modified the server web.config file to permit the FLUT01.aws file (see previous entry) to be downloaded instead of just getting an IIS error message! I have two program manuals for FLUT, one from 1967 and one from 1974. Hopefully they will provide the information needed to successfully run FLUT (a standalone program) under the Hercules emulator. I am keen to do this as one of FLUT's functions is to print detailed information from FLT tapes. I want to be able to do this with the FLT tapes I have as there is a lot of bit-level information about the S/360-65 ROS that I'm interested in. Note that the terms "CE", "IOCE", and "SE" are synonymous with "CPU", "Channel", and "Main Storage" respectively. Thanks to software wizard Camiel Vanderhoeven (Operation Blinkenlights) I now have Tape01 in .AWS format: Tape01.aws . 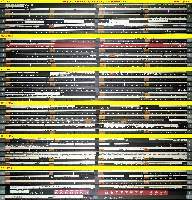 Viewing this tape image in AWSBrowse reveals that it is essentially a 9020 system maintenance tape. The middle word of each of the 12-byte blocks is the 'identity' of an individual maintenance program, of which there are just over 500 on the tape. The blocks following these 12-byte headers begin with the same program identity. The main part of this tape (which is stand-alone IPL'able on a 9020 system) consists of a large number of hardware diagnostic routines (or "sections" as they are called), most of which check out the operation of individual CPU instruction. I have the full user manual for this tape plus the source code of all the sections - to be uploaded in due course. Here is a page from the CE Parts Catalog where I have highlighted the Dynamic Address Translation frame that is not found as part of the standard Model 65. I know the picture below is a 50 and not a 65 but red is my favourite colour!